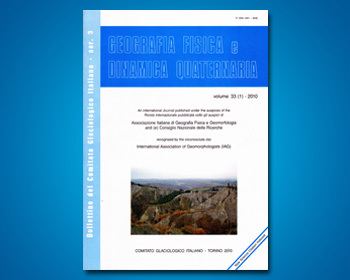 ARMANDO E., LANZA R., RODRIGUEZ E. & SAMBUELLI L.
The hill of Rocca di Cavour is a separate outcrop of the Dora-Maira crystalline massif rising above the southwestern Piedmont plain. A geophysical study based on gravity survey, on vertical electric soundings and on magnetic profiles has revealed the main features of the top of the crystalline basement linking at depth the Rocca with the outcropping massif in the Alps. The Bouguer anomaly map shows the abrupt uprising from the buried basement of the Rocca di Cavour as well as of the neighbouring relief of Monte Bruno. A quantitative interpretation of the local gravity anomalies and of the electric soundings gives a mean depth of 300 m for the top of the basement. Morain deposits buried at shallow depth below the alluvium at the forehead of the Pellice valley are recognized by electric soundings and magnetic profiles, thus suggesting that glacial abrasion controlled the morphology of the Rocca di Cavour as well as of the crystalline basement at the mouth of the Pellice valley.